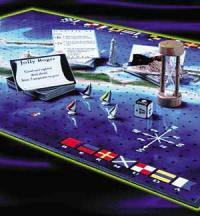 Let this new board game make any day a sailing day. You can experience all of the exciting elements of actual sailing no matter what the weather is outside. For the sailor who thought he had everything - now there is Nautical Trivia - the first board game that combines the strategy of a sailing race with the popular concept of a trivia game. High quality components, pewter pieces, bright and realistic graphics promise many years of fun and challenge. A roll of the cube determines whether the driving force that propels your boat will be by knowledge or chance. Questions challenge your knowledge of nautical history, the America's Cup, historic lighthouses, navigation, boating safely - the list is endless - learn as you play and increase your nautical knowledge.